Leave aside the obvious travel hoist or crane option. The diagram is based on an original Fairey marine drawing. 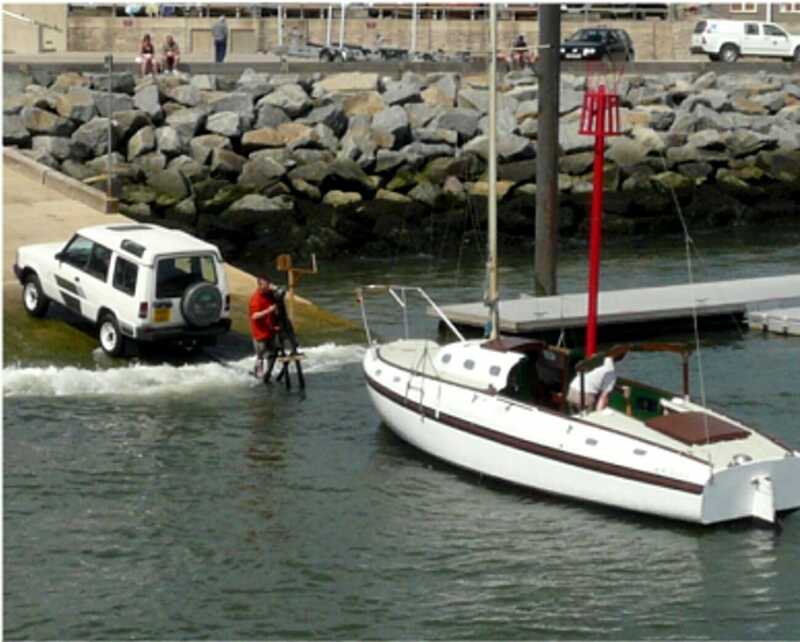 The boat and trailer combination were always intended to be used to recover the boat onto the trailer on a slipway. Firstly Fairey Marine supplied a trailer with docking arms, two on each side to line up the boat and trailer. Ropes attach to the front of the trailer, and are led to hooks on the side docking arms. One rope goes to each side. The trailer is lowered into the water (attached to the car by a rope) until marks on the front arms are on the waterline, and then the boat is driven onto the trailer (with the keels raised) between the side docking arms. The ropes are taken from the side docking arms and fed around the sheet winches. The ropes are marked so you winch until the mark just reaches the winch. Similarly ropes at the front (with eyes in them to determine their length) fit to the bow cleat. Then the car slowly hauls the trailer out. The ropes define the fore and aft position of the boat on the trailer. The docking arms define the side to side position. So the boat should end up out of the water and sitting on the trailer in the correct place. A variation on this is to have a front docking arm for the bow to nestle against. A 184 Aquilo 2 approaching the trailer ready to be recovered. It sounds easy when you write it out like this, and I have done this numerous times. It works. Avoid cross winds and cross tides! It really needs 3 or 4 people, a car driver, a boat driver, someone to catch docking arms and ropes, and someone to see what is happening and yell stop when needed. Or you could use a travelhoist. Or a crane.